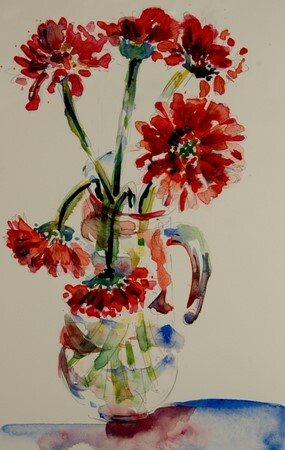 I did my last sketch here in SC, this morning – a handful of Gerbera daisies in a jug. Their bright, vibrant colour, strong, upright stems and big, hearty flowers remind me of my mother who was as gracious and wonderfully spirited as these beauties. After I sketched them, I thought it would be a perfect goodbye to SC. I am leaving for MY HOME!! on Thursday and my spirits are high. I’ve enjoyed my stay here in SC, but I miss the embrace of my home, the smell of my wooden floors, the touch of the old stone under my fingers, the squeeking of the bathroom door. I miss the warm bodies of my cats, the calling for their food in the morning. I miss the sunsets on the Loire and I miss the early morning rustling noise of the birds in the trees. I miss my studio and I miss my friends. I miss my croissants and I miss my garden. I hope this note finds you back in your home, in your studio with kittys in your lap, croussants at your fingertips and friends at your table! It is good to come home.